With Easter coming, you may want to get a bit craftsy. We’re not suggesting that you mold your own chocolate bunnies, make rocher nests of almonds and chocolate filled with your own truffles, or take on homemade Peeps. 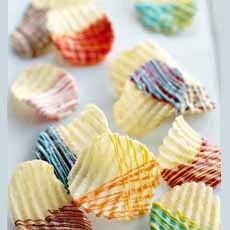 Rather, just decorate some of your everyday favorite snacks with drizzled candy melts in seasonal colors. Heating a drizzle pouch or two of candy melt drizzle (photo #1) in the microwave. Laying cookies, potato chips, pretzels or other snacks on a baking sheet. Snipping off a corner of the pouch and drizzling the color(s) over the snacks. Chilling until set, about 5 to 10 minutes. As with chocolate, candy melt brands vary by quality and price. Merckens* and Wilton are two quality brands. You also want to use fresh melts—nothing that’s been sitting in a cupboard (or on a retailer’s shelf) for a year. Wilton drizzle is $1.99 for a 2-ounce/56g pouch. 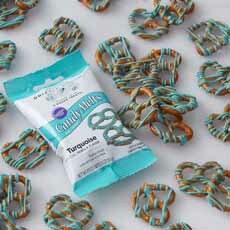 One package covers 3 dozen mini pretzels, as shown in photo #1. You can buy them online or check the Wilton store locator for a retailer near you. Don’t buy candy melts way in advance to keep until you need them: Fresh candy melts work better. *All colors of Merckens wafers are flavored with artificial vanilla, as are the vanilla-flavored colors from Wilton. 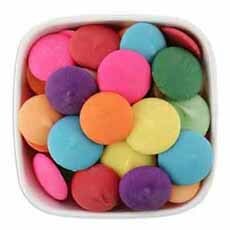 Candy melts are great for decorating, and people, and some people melt the wafers into colored bark and other candy. But flavor-wise, they are no substitute for chocolate—or for hand-tinted white chocolate. †These are artificial flavors as well. The chocolate varieties are flavored with cocoa. 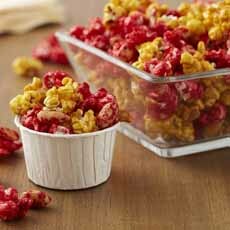 Recipes for   and  from Wilton: drizzled pretzels, drizzled potato chips and colored peanuts-and-popcorn. 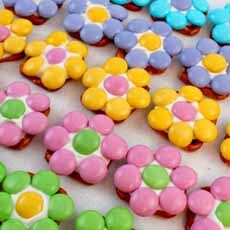 Flower bites made with pretzels and Easter M&Ms, bound together with white candy melts. Here are instructions from Two Sisters Crafting. Candy melts come in a rainbow of colors, that can be blended together to make still other colors. These may look like chocolate wafers from a fine chocolatier, but they’re candy coating—candy melts—without any cocoa butter (both photos courtesy Merckens). WHAT ARE CANDY MELTS? Candy melts are not quite chocolate, but they look like it. They are made in two formats: disks/wafers to melt and then use to decorate confections (used to adhere the M&Ms in photo #4 and larger projects like these), and microwaveable pouches to drizzle (the used in photos #1, #2 and #3). Candy melts have several other names: compound coating, confectionary coating, decorator’s chocolate, pâté glacée and summer coating. Candy melts are an imitation chocolate product that substitutes vegetable oil for all or part of the cocoa butter in chocolate. In milk chocolate-flavored melts, whey powders, whey derivatives and dairy blends can be used instead of powdered milk. Thus, the flavor of candy melts is not as fine as chocolate. If you bite into a piece of “chocolate” that doesn’t taste as rich or velvety on the tongue, it may well be made from candy melts. People who think they “hate white chocolate” may have experienced white candy melts instead: artificial chocolate flavored with artificial vanilla. Sometimes, the most beautiful creations are crafted from candy melts that don’t taste as good as they should. Why do people use candy melts if it isn’t as tasty? It is significantly less expensive than chocolate (and kids likely won’t notice the difference). 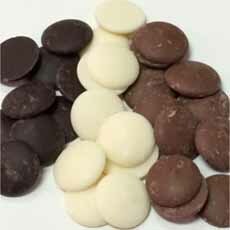 For color, it is easier than tinting white chocolate. It does not require tempering, but melts easily. It can be thinned out to make as delicate a decoration as the user wants. It hardens quickly, and once hardened, does not melt in the heat like chocolate. Before universal air conditioning, chocolatiers used confectionary coating to create their summer wares, including chocolate-dipped fruit. The white coating was often tinted pastel pink, blue and green. The products were called “summer chocolate,” not artificial chocolate. Again, that’s why so many people dislike white “chocolate.” Give the best white chocolate a try. There are plenty of videos on YouTube and online articles that explain how to work with the disks. However, since the ideas above use only the drizzling pouches, not much instruction is needed except: Start with a very small cut in the pouch or your drizzle may wider than you’d like. Here’s how to read the freshness code on candy melts bags.